After 120 hours, 50 levels gained, 100+ quests completed and a higher body count than the Khmer Rouge, its safe to say that Bethesda has provided a much needed fix. 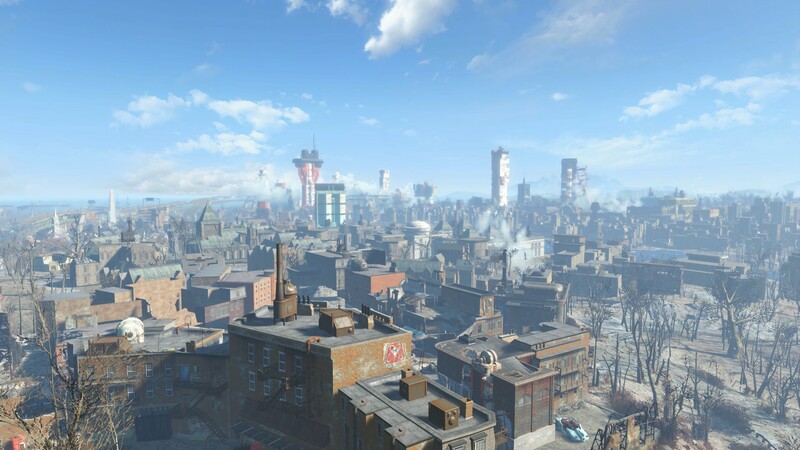 Fallout 4 is their most ambitious world yet, in terms of scale. Some mechanics changed (no more skills, fully voiced protagonist, crafting and settlements) and many stayed the same. Is it the best in the genre? Maybe, and this review aims to find out how it stacks up against its predecessors. Fallout 4 is the prettiest princess at the ball. No open world game of its type has looked better out of the box, and everything great about Fallout 3‘s aesthetic has been amplified. The gray/green/brown goop is still present in the less populated portions, but its broken up by shocks of reds, blues, yellows and teals. The design of the Institute invokes a little bit of Cerberus, a dash of NERV and a nice throwback to the computers/monitors of Fallout 1 and 2. The future-retro vibe improved in this iteration, particularly on set dressing such as posters, furniture and the covers of skill books. Perk and Quest animations are a nice touch of flair as well, with the former just begging for some social media emojis. Commonwealth face with Arroyo booty. Vault Dweller got back. If it looks good, it feels even better. The game effectively handles the same as it’s predecessors, with one notable upgrade. Downtown Boston, unlike DC, is the sprawling urban jungle everyone wanted. Platforming gets its highest degree of emphasis since Oblivion, and the use of vertical space is superb. The city is totally open to explore, at a number of elevations, and the player isn’t forced into load screen after load screen of navigating dilapidated subway tunnels. Instead, they can hop between highway overpasses onto skyscrapers and take in a serene vista just before exploding a mutant’s head with a teddy bear from the Junk Jet. This game doesn’t look especially impressive when viewing the world map, but its scale is enormous (even moreso than Skyrim) and there isn’t a lot of space utterly wasted by invisible walls and mountains as uneventful as they are impassable. Even the water regions have some notable highlights, like the ramshackle raider city of Libertalia. All this can be explored without taking the subway. On a more mechanical note, a few changes to the gameplay created some really handy conveniences. Being able to walk away from an NPC mid-conversation provides the ability to buff stats with clothes and chems to pass a dialogue check, versus potentially being trapped and forced to fail said check. The sneak bar is a little more detailed, with the distance from brackets to text indicating how close (or far) enemies are from reaching the next stage of alert. On the surface, this game is off to a great start, but its not without some blemishes. Since Morrowind, Bethesda’s main stories have been a source of consternation for their fans, with plot points and character motivations treading into Star Wars prequel territory. 4 starts out well enough, by mirroring Fallout: New Vegas in having the first half feature a revenge tale of tracking down the man who murdered the protagonist’s spouse and took their child (versus Benny failing to murder The Courier). From there, the player determines which of the four major factions to side with, culminating in a final confrontation that leaves at least one faction in a pile of ash. It’s definitely more open ended than 3, and there are some redeeming qualities to every side, unlike the clearly good/evil dichotomy of the Brotherhood of Steel and Enclave. It’s made readily apparent that the Institute are the bad guys, just not the only ones, and the option is present to actually work with them with a variety of quests. Certainly better than “take this vial to kill basically everything in the Capital Wasteland, because a human would somehow prefer that over clean water”. Expanded ending choices is an improvement, the quests to track down the player’s son and the Institute are an improvement, but the finer details leave much to be desired. DISCLAIMER: The rest of this section will contain plot spoilers. It’s disappointing that the protagonist isn’t allowed to deduce the massive time gap between Shaun’s abduction and the Sole Survivor’s unfreezing, considering that period of time was roughly sixty years. Nuking the Institute is a terribly wasteful solution, particularly for the Railroad. Why waste all that tech and risk killing so many of the synths they wanted to liberate? On top of that, the player can be named Director of the Institute following Shaun’s death, so the Railroad could have simply waited and had the synths freed by executive order. Then all the tech and research goodies could be shared by the denizens of the Commonwealth. Just want to set the world…on…fire! There’s also no chance for any accommodation between factions, as the ending involves eradicating some combination of the Railroad, Brotherhood of Steel or Institute. Murder sprees can be fun, but with all the emphasis on fully voiced dialogue, surely some higher ups in the Brotherhood or Institute could be convinced of synth sentience. Then again, the Brotherhood never distinguished between feral and sentient Ghouls in 3, either. All told, there’s nothing in the main story as bad as “[Intelligence] So you fight the good fight with your voice“. 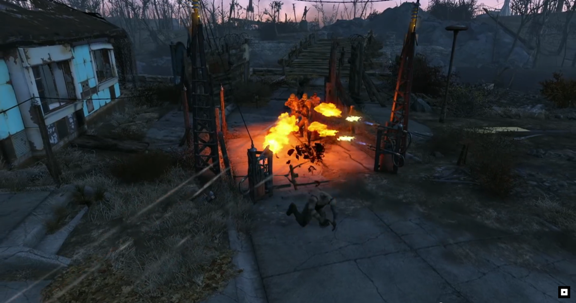 A number of the set pieces (particularly the Memory Den and traversing the Glowing Sea) are tons of fun. The beginning doesn’t drag as much, and gets the player into the Wasteland sooner than 3. It’s an improvement, though marginal, and could arguably be attributed to the effect saying dialogue aloud has on one’s writing. Bethesda veterans are accustomed to the main story being the weak point, mostly existing to change the world’s make-up at various junctures. 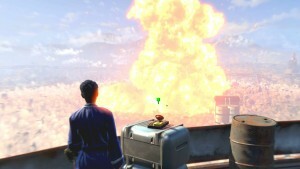 During the E3 presentations, the emphasis placed on a better main story provided some hope that Fallout 4 might be the exception. Instead, it proves the rule. The most sensible solutions to the primary conflict are not options available to the player. At least the protagonist isn’t expected to die in a radioactive chamber while being accompanied by a Super Mutant, Ghoul, or Mister Gutsy. While the main story is arguably the biggest weak point, it still provides a lot of amusing interactions and can be completely ignored if the player wishes. A complete gaming experience can still be had with only the side quests. The fully voiced protagonist is a revolutionary step for the franchise, and with it came a major overhaul to the dialogue system itself. Brain T. Delaney and Courtenay Taylor star as the Sole Survivor, with the latter best known for her work as Jack, the psychotic biotic from Mass Effect. It turns out they brought more than Jack over from BioWare, their patented dialogue wheel takes center stage in Fallout. The results are mostly good, with a few notable issues. The voice acting itself is solid, with reservations made that this franchise takes a tongue-in-cheek approach to a lot of its script. In a standard conversation the player will have four basic options for commentary: Nice, Joke, Question, Jerk. The joking/sarcastic lines fit like a glove and tended to be well received by most NPCs. Nice is typically the least interesting choice, with the Sole Survivor plastering a smarmy grin over their face, wide enough to push the skin of their cheeks through the frame of their glasses. Then again, it serves the player right for choosing the most whitebread answer. A press conference, this ain’t. Question is interesting, typically its a bid for elaboration on a quest, but depending on the context it can take a doubtful or disbelieving tone. Jerk is a lot of fun, just like the previous games, but prepare to start fights if its selected too often. You know Fallout is fictional because fedoras don’t carry a charisma penalty. The only issue with these options is most NPCs have little reaction depending on which tone is selected. There might be a “thanks” or “*tut tut* smartass”, but otherwise the conversation continues in the same vein regardless. It ultimately doesn’t matter much what the player says, beyond base entertainment value. Just don’t be too much of a jerk. The worst news is skill checks not directly based on Charisma are completely absent (outside of two Intelligence checks in one quest). On the positive side, it pares down the apparel tab to one combat outfit and one social outfit. It doesn’t really jive, from a roleplaying perspective, to make this change. Being a smooth talker is a valuable asset, but a number of the situations its used would make more sense if they were a perk check, and featured the player eliciting specialized knowledge to persuade. It wouldn’t have been difficult to implement, just gray out a dialogue option with [Perk | Rank] needed, and should the player pass, its selectable. That said, this game isn’t lacking for quality dialogue, and the sacrifices made did create a more cinematic (and convenient) talking experience. While the main story wasn’t much to write home about, many of the followers’ tales elicited a level of pathos not yet felt for a Bethesda NPC. Every sentient companion has a deeply personal backstory, which the player can discover by traveling with them and doing stuff they like (i.e. picking locks, shaking people down for more money, appealing to someone’s good nature). The improvement in writing is felt most prominently with conflicts like Nick wrestling with his sense of identity, Deacon‘s feelings towards his origins and Cait‘s struggles with her past and present trappings. There’s also a fun callback to Fallout 3 with MacCready as a recruitable follower, who features an exceedingly overpowered (and bugged) companion perk to boot. Unlike New Vegas, these companion perks are earned only after reaching maximum affinity, but its a permanent perk that the player keeps even after dismissing said companion. Even better, many of the companions are romanceable, and sleeping with them grants an improved “Well Rested” perk, along with some additional dialogue. The unaffiliated side quests do an excellent job fleshing out the world, and provide some of the most enjoyable missions from a pure gameplay perspective. It also lets the actors have a little more fun with the dialogue, most prominently in the Silver Shroud quest. Those who didn’t complete that mission in character deprived themselves of the finest in Christmas hams. Speaking of Christmas, some NPCs get special dialogue if the game is played on a major holiday. Silver Shroud isn’t just the best quest, it gives the best outfits, to boot. Unfortunately, the side quests did suffer from a lack of variability. The biggest strength of 3 was how many different ways quests like Tenpenny Tower or the Superhuman Gambit could be completed. In 4, the quest structure is almost always “kill or find [thing] at [place], report back for reward/further instructions”. The basic gameplay in these is still fun, but a little nuance goes a long way and the constant reporting back leaves a lot of waiting on load screens. There’s still some quests with legitimate choices (like The Devil’s Due, which rewards ignoring all conventional logic), but most aren’t as open ended as their predecessors in 3. On the bright side, there’s more of them. There’s a lot more fun options for radiant quests this time around. While there’s no lack of fetch quests, many serve a higher purpose. Taking Point missions unlock settlements, MILA/Jackpot missions show off stellar loot caches and provide interesting platforming challenges. There’s a greater degree of variety in this iteration, with very substantial rewards for completion. A step up from both 3 and Skyrim, but not free of tedium. On the topic of tedium, Preston Garvey is best avoided if one prefers a clean quest cue. His radiant missions are often repeats, and he assigns them whenever the player is in spitting distance (often without consent). It may be best to leave him at a rarely visited settlement once the main game gets going. The removal of skills and replacement with the perk chart is the biggest overhaul the franchise has seen. 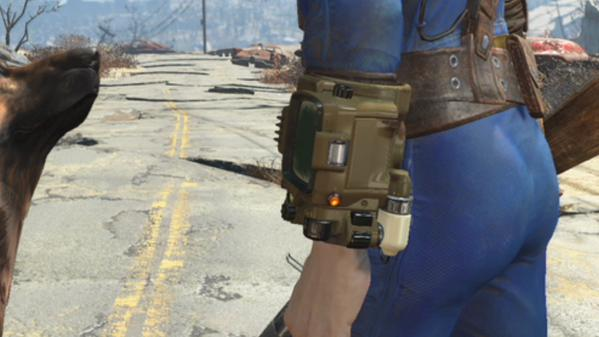 It also worked really well, and alleviated some issues with previous Bethesda titles. There’s a little less level scaling for enemies, and more high powered perks available immediately (character stats pending), so overlevelling is less of a concern. It’s also a game that rewards having SPECIAL stats at 10 early, as buffs can exceed that number, and a bobblehead can turn that stat up to 11, permanently. Conversely, its a lot more okay to leave a stat or two at 1, to enhance specialization. Combat skills are broken up a little differently as well. Before, everything fell into a category of Guns (Big/Small), Energy Weapons, Explosives, Melee and Unarmed. That still covers the base weapon types, but the corresponding perks are divided by automatic weapons, pistols, rifles, big guns, melee, unarmed and explosives. The advantage of the new gun perks is they apply to both conventional firearms and energy weapons. It makes a lot more sense within the world’s logic, since crafting either guns or energy weapons requires a separate perk. A character favoring rifles, who only invested in Gun Nut, would still be able to use a good energy weapon, but would need to purchase mods from a vendor to improve it (versus crafting it with junk at a work bench). The best part about the new system is it provides more interesting theme builds. An all melee character was a tricky proposition in previous Fallouts (heck, it was a chore in Skyrim and Oblivion as well), but with the addition of perks like Pain Train and Blitz, its workable as both a hulking berserker or pseudo-teleporting ninja. Stuff is good in Bethesda games, its arguably what they do better than any other publisher. Stuff is even better in Fallout 4. Power Armor is a proper mech suit this time around, which requires fuel and occasional repairs/part replacement to stay working. Fortunately, both the fuel and parts exist in such abundance, so there’s no concern it will fail in a tight spot. If that wasn’t enough, the game provides the option for jet packs and helicopter escapes! Regular armor is awesome, since its split into pieces to create an arcane pastiche of SPECIAL buffs and damage/movement boosts. The new look/feel for power armor works really well with the Brotherhood’s turn to Warhammer Space Marine antics. Weapon/Armor/Chemical crafting is a breath of fresh air over the repair system. Bad weapons can get either sold or broken down into raw materials (Scrapper is a huge time saver in this regard), good weapons can be upgraded to stay viable over most of the game, should one develop an attachment. Mixing chems produces bonkers results, and is the failsafe for any sticky situation. The legendary system is…okay. There’s enough set unique weapons handed out via quest or discovery to plan a playthrough around, because the random drops can be very unkind. Sure, ignoring 30% of armor is a helpful boost, but its stuck on a walking cane. The legendary enemies themselves put up a good fight, and their second wind provides an unpleasant surprise to the unprepared. With the repair skill no longer relevant, Bethesda needed new ways to differentiate between only a handful of base weapon types. The randomness of the legendary system hurts about as much as it helps. 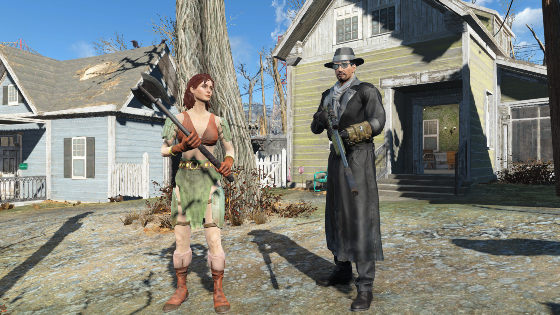 Everyone’s happy to pull a two shot Sniper Rifle from the corpse of a radroach, but most of the time that’s going to be a Pipe Rifle. If it were tied more to strength of enemy, with high level Deathclaws or Mirelurk Kings all but guaranteeing a viable item + perk combo, it might be good. As it stands, its adequate. On the bright side, collecting skill books is a lot more impactful this time around. All the perks offered stack with the experienced based perks, so there’s no redundancy of reading a Tumbler’s Today while already at 100 Lockpick. On the downside, the misc. tab is completely untenable. They stuck skill books, quest related items, holotapes and individual keys all in one field. Why didn’t they stick them on a key ring or their own field like all their other recent titles? The clutter ruins one of the better aspects of the game, because Bethesda outdid themselves in the quality of holotape recordings and terminal entries. That goes to waste when the player can’t find them in the inventory. Kevin McAllister, eat your heart out. For as awful as Preston Garvey is to deal with, he does introduce the settlement building feature, and that’s arguably the best new addition to the game. Its not a perfect system by any stretch, but it finally gives a Charisma based character their proper due. Custom shop owners provide unique equipment not found elsewhere, settlers can be assigned tasks to stockpile crafting materials, purified water (liquid gold, the most efficient method of becoming the wealthiest wastelander), or defend the base. That defense does matter, as there’s a fair chance a settlement could be attacked if their resource values exceed defense values. Its a fairly rare occurrence, nothing like FarCry 4, where a base got attacked seemingly every time the game booted up. The actual building aspect is pretty fun, too. There’s about the level of jank expected for Sim mechanics placed in a non-Sim game, but things work the way they’re supposed to most of the time. It’s usually funnier when it doesn’t. What it really provides is a nice break from death and dismemberment to stretch some creative muscles, anyone that ever made a pillow fort will enjoy this to some degree. Except now, that pillow fort has laser turrets. 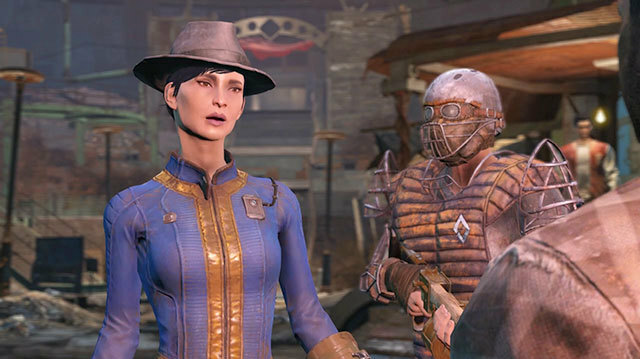 After all this, how does Fallout 4 stack up to its predecessors? Fallout 1, 2 and Morrowind have it beat on main story, but never had the chance to come close on matching its quality of gameplay. Its better in virtually every respect than Fallout 3 and Oblivion. Skyrim ended up having a lot more marked quests than Fallout 4, despite having a smaller world. 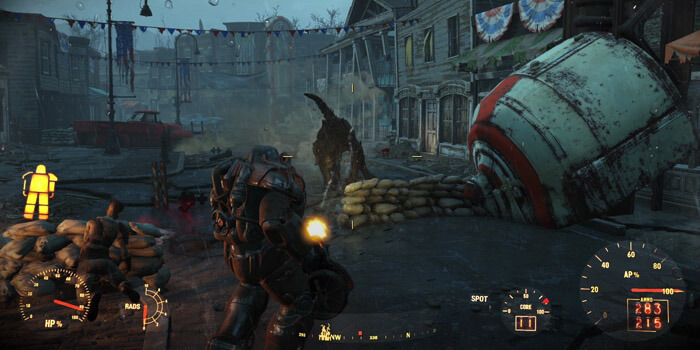 Fallout’s leveling system is strictly better, since it rewards general accomplishment rather than specific action, so a player can choose secondary combat/crafting skills late in the game without additional grinding. Despite the misgivings of 4’s main story, it does deliver a superior collection of tales to Skyrim, and its radiant quest jank still isn’t as bad as the Thieves Guild. So it comes down to Fallout 4 vs. Fallout: New Vegas. Visuals give 4 an easy edge, and for the most part it takes the cake on gameplay. However, New Vegas has the finest array of unique equipment in any RPG of its type, and it has a quality crafting system of its own, possibly more in-depth than 4 once all the DLC is included. The story? Not many games have penned a better collective epic than New Vegas, and Fallout 4 isn’t one of them. Of course, this is comparing the launch day 4 to a New Vegas that has all its DLC released (arguably the best DLC suite of any game). Currently New Vegas has the edge in the most important areas, but its not a drastic one, and could be easily overtaken should Bethesda deliver some quality additional content. This is a title fight between two of the best games made, and the young buck still has room to grow. The good vastly outweighs the bad, and earns Fallout 4 a 9 out of 10. There’s so much this game does well, that nothing else can match.